The price is 25 € person/night, minimum stay of two nights. Check prices for overnight one night. There are discounts for children under 12 years old in low season. The tourist tax is not included in the prices. Apply € 0.45 person / night for over 18 years. 1st. Smoking is not allowed inside the house. 2nd. Not allowed to music until late at night, inside or outside the house. 3rd. Not allowed guests receive guests not staying overnight in the house. 4th. The outstanding amount of the reserve will be paid on arrival to the delivery of keys. In the case of acting in bad faith on the points detailed close the home without any refund amount. Playground for children, games room with billiards, ping-pong, table football. 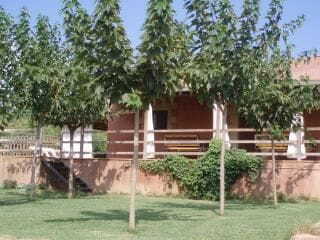 The house has five bathrooms, living room with fireplace, fully equipped kitchen (gas cooker, fridge-freezer, dishwasher, microwave, pimera, toaster and others), also offers TV, heating, airecondicionat, clothes , towels, table linen, free Wi-Fi throughout the property, etc. Organized menus stakeholders two weeks in advance and payment of all by bank transfer.